Cerritos Beach, El Pescadero, Todos Santos and Baja Sur! 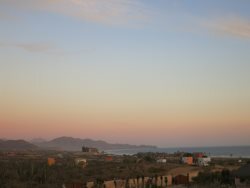 There is a lot to do in our part of the Baja Sur. We are a 10 minute walk to the beautiful Cerritos Beach where you can swim, surf, drink, eat and relax. El Pescadero and San Pedrito Beach are just a 10 minute drive away or a 30 minute walk over the hills. It's some of the richest farm land around and peppered with unique businesses, farm to table restaurants and and of course, great surf. The Pueblo Magico town of Todos Santos is just a 15 minute minutes drive away. It's chalked full of amazing art galleries, delicious restaurants, unique boutiques and endless charming streets to stroll. EcoBaja Tours They are also an option for shuttle service for those of you that are more adventurous.